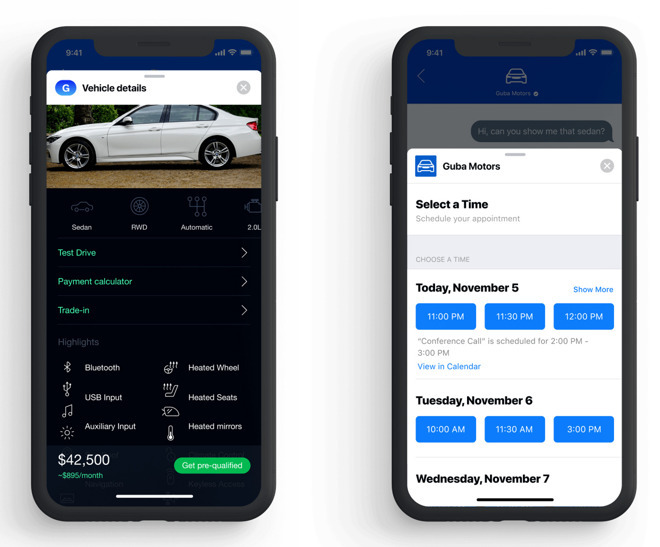 Business Chat brings a "Chat with Messages" button to dealer sites, and tapping on it will connect with Gubagoo chat crews via the iOS Messages app. From there a person can browse car inventory, ask questions, and book appointments such as repairs or test drives. Tapping on a vehicle in chat will pop up a range of tools and details, such as a payment calculator, trade-in options, tech features, and performance specs. People can even go through early application stages, finishing up in person if and when they decide to buy. While the average person may not know Gubagoo the company claims over 4,000 dealerships as clients, making it likely that online car shoppers have run into the company's platform. Until now that platform has been linked exclusively to the Web and Facebook. Apple Business Chat expands on normal Messages functions so companies can support or sell to customers on iPhones and iPads. For Apple, at least part of the point is probably deflecting people away from Facebook Messenger, which not only offers similar services but is one of the world's most popular chat platforms in general, with the advantage of being cross-platform. Messages is only on iOS, watchOS, and macOS. Also on Tuesday, brokerage firm TD Ameritrade began offering both Business Chat and Apple Pay, letting people transfer up to $10,000 per day to their accounts for immediate use. Previously clients had to conduct wire transfers or wait several days for money to process. Let's hope Gubagoo's product has no bugaboos.